Our Franciscan friars in foreign missions proclaim the Gospel of God's Love in a ministry that is at the core of our Franciscan tradition. St. Francis himself envisioned friars taking the Gospel to the far reaches of the world, to cultures unknown to them. There they would be challenged to serve in new ways and to share the Good News of love and reconciliation as “pilgrims and strangers.” St. Francis himself undertook a perilous voyage from Assisi to the Holy Land, and friars even reached the British Isles during his lifetime! Franciscan history is rich with examples of committed missionaries who responded to God’s call to take the Gospel to places far from home, far from the familiar. Casa Franciscana is a unique international ministry which brings together friars and lay people of both Mexico and the United States. 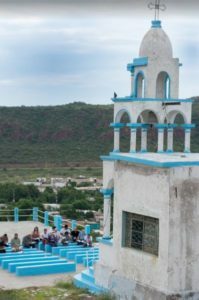 For more than 40 years, Casa Franciscana has provided a broad range of critical assistance to the people of the struggling port city of Guaymas, Mexico. For more information on Casa Franciscana and the variety of direct services it offers to the to the poor and marginalized, go to https://casafranciscanaoutreach.org. Established by Brother Ivo Toneck, OFM, in 1996, Bellas Artes is an innovative fine-arts school for children from poor and marginalized families in Guaymas. The school educates students in classical music and in the traditional dance and music of the Sonora region. Bellas Artes began with a mariachi group of 22 youngsters from around Guaymas. After much practice (and fundraising), the group embarked on a three-week European tour, the highlight of which was a performance at the Vatican. Pope John Paul II – now Saint John Paul II – joined the group on stage, accompanying them in song in a performance broadcast throughout the world. The Foundation of St. Francis of Assisi in Russia-Kazakhstan, or the Russian Foundation, for short is a project of the entire Franciscan order, with friars from many parts of the world coming together to provide a Franciscan presence in various regions of the former Soviet Union. Franciscan friars from the Province of Saint Barbara have been involved in the Russia Foundation project since its inception, with Father John Gibbons currently active in service to the Gospel in the cities Ussuriysk and Arceniev, in the region of Siberia. The Holy Land Mission is served by a special entity of the Franciscan Order called the Custody of the Holy Land. The mission of the Custody depends upon the presence of the friars making a life commitment to the Holy Land, as well the involvement of friars from Provinces around the world who volunteer for limited periods of service to pilgrims and to local Christian communities. Over the years a number of friars from the Province of St. Barbara have committed themselves to ministry in the Holy Land. For more information on the Holy Land Mission, visit the website of the Custody: http://custodia.org.